We’re continually compiling educational material to help you be a virtual cigar expert. Keep checking back to see what’s new. The filler is the center, which comprises the majority of the cigar. These leaves often come from different fields, regions, and countries. Cigar filler is primarily from the Caribbean, Central and South America and Mexico. Dominican has a medium body with sweet undertones; Honduran is rich with coffee tones; Nicaraguan is spicy/earthy, and Mexican filler tends to be strong, sweet and spicy. Binders are the strong, flexible tobacco leaves holding the cigar together. Found between the wrapper and the filler, the binder holds the form of the cigar true to its shape. The thicker tops of the tobacco plant are used as a binder. The wrapper (outer covering) can contribute from 60% to 80% or more to a cigar’s overall flavor. Wrappers grown in the shade will be smother, have smaller veins and should be slightly oily. Those grown in the sun will be darker, have larger veins and should be velvety to the touch. They will tend to have a full flavor and hint of sweetness as the increased sun exposure increases sugars on the leaf. The journey of a handmade cigar is a long one. From seed to its final packing, a single stick pay pass through as many as 200 pairs of hands during the artful process of creating this true handmade luxury. Growing tobacco requires exceptional artistry and experience. Plants are nurtured in nurseries and the seedlings are transported to fields. When it’s time to harvest, leaves are picked from the bottom to the top. Valdo, the bottom leaf, has the mildest taste. Seco, In the middle, has a medium flavor. Ligero, at the top, is exposed to the most sun and has the strongest flavor. Specially chosen leaves are bundled according to size and hung to dry in curing barns for six to eight weeks. During curing, the tobacco must ferment to remove ammonia and other natural chemical components. Improperly fermented tobacco causes harshness or bitterness and will not stay lit. After this preparation, the master blender pre-blends the filler by selecting a special combination of tobacco leaves. Expert hands make the difference in a fine cigar. The “buncher” forms the filler into a cylinder, which is rolled into a binder leaf and placed in a mold to coax it into a cigar shape. The “roller” then skillfully applies the outer wrapper tobacco leaf. After rolling, cigars are placed in the “marrying room” for a minimum of three weeks. This is a temperature and humidity-controlled cedar room that gives the selected tobaccos time to meld their tastes and allow the moisture to equilibrate. Like with fine wine, country of origin directly impacts the flavor and aroma of a cigar. Soil conditions, temperature, humidity, and sunlight all create distinct characteristics in the tobacco. Dominican Republic – Producer of top-quality tobacco, especially in the Cibao River Valley area near Santiago. Connecticut Valley – Source of some of the world’s finest pale wrapper leaves highly regarded by cigar makers and connoisseurs. Connecticut Shade is shade-grown under huge tents to protect the delicate leaf. Connecticut Broad Leaf is grown in the sun for a wrapper that’s coarser, darker and produces a sweeter taste. Indonesia – Indonesia wrapper tobacco is dark, tasty, and fragile in nature. Recently, special strains of Java married with Connecticut tobacco are producing a rich, flavorful, fine-burning wrapper and binder tobacco. Grown under shade, commonly referred to as TBN. Mexico – The San Andreas Valley is famous for a sun-grown Mexican Sumatra used for wrappers. Dark tobacco used for long fillers and binders gives the cigar a distinctive sweet, peppery, light texture. Mexican wrapper leaves are often used for Maduro wrappers. Nicaragua – Nicaragua’s bold, full-flavored tobacco, attributed to the region’s optimal climate and soil, is said to rival the best of Cuba. There are three main tobacco-growing regions: Esteli produces full-flavored tobacco, Jalapa is sweeter, and Condega falls somewhere in between. Cameroon – The West African country is known for a high-quality neutral wrapper leaf that’s ideal for full-flavored filler blends. Because of bad weather and political climate, availability has suffered, but the leaf remains a favorite among cigar connoisseurs. Ecuador – A producer of both filler and wrapper tobacco as well as shade and sun grown. There, tobacco grown using Connecticut and Sumatra seeds tends to be milder in flavor. Honduras – Honduras produces quality Cuban seed and Connecticut seed tobaccos, both Full-bodied, with strong, spicy flavors. Connecticut seed variety is shade-grown in Honduras and similar to Connecticut grown shade leaf tobacco. Brazil – Tobacco from Brazil tends to be dark, rich and smooth with a slightly sweet flavor. Brazilian tobacco leaves become deep brown after fermentation. Cuba – Cuban tobacco is known as some of the finest in the world. The premary growing region is the legendary Vuelta Abajo area in the western part of the country. Ever since the U.S. embargo in 1963, Cuban-grown tobaccos are not used in cigars sold in the United States. Recent changes in diplomatic relations between the U.S. and Cuba may also lead to a change in this policy, but it will also lead to many fake Cuban cigars flooding the market. Keeping your cigars fresh requires proper storage and humidification. Improperly stored cigars can become dry and brittle, or with too much humidification can become soggy and even grow mold. Thankfully the perfect environment is not difficult to achieve when using Boveda 2-way humidification packets. 5 Common Questions we get About Using Boveda for Tobacco Storage: How do I choose the right number of Boveda? We recommend using at least one 60 gram Boveda per 25 cigars your humidor holds, even if it isn’t full. The air space and wood still needs proper humidification. Boveda will never humidify beyond the RH printed on the pack, so using more than the minimum will work more efficiently and need less frequent replacement. That means you never buy more Boveda than you need, they just last longer. Boveda has a 2 year shelf life when left closed in the original packaging.​ Even in the 20-pack brick. What humidity level do I need? Boveda is available in 62, 65, 69, 72, 75 and 84% RH (exclusively for seasoning). All Boveda are accurate to +/- 1% of the RH printed on the pack in an air-tight environment. Humidors are not air tight. Depending on humidor quality and ambient conditions, it’s not uncommon for the actual RH to stabilize anywhere a few points below the Boveda RH you’ve chosen. This is why we recommend 72% for your first set after seasoning. If it’s 72 on the nose, you’re perfect. If it drops a few points, you’re still perfect. 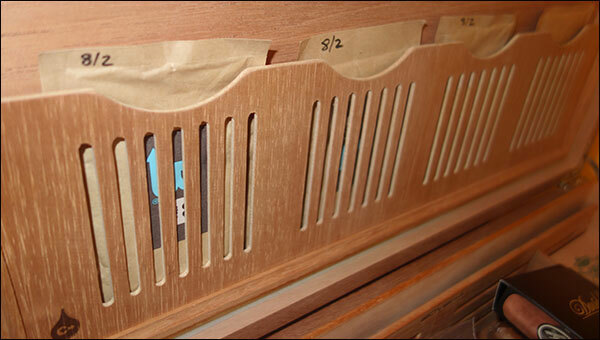 Based on how your humidor performs, you can decide whether to move to up or down. Did you know you can season your humidor with Boveda? Seasoning is the act of giving the humidor all the water it needs. Wiping a humidor down or using glasses of water is dangerous. Nothing good happens quickly in cigars. The 100% safe way to season uses one 84% 60g Boveda for every 25 cigar capacity the humidor holds – for 2 weeks. Don’t forget to remove your cigars during seasoning. While the humidor seasons, keep your cigars in a Humidor Bag or in Tupperware with a 60g of 62-72 RH. Learn more about seasoning Can Boveda directly touch my tobacco? Absolutely. Boveda is 100% safe to lay on / in / amongst your tobacco. To further class up your humidor, single metal holders or two and four pack cedar holders are available. Why shouldn’t I use Boveda with other humidification devices? Boveda was designed as a stand-alone 2-way moisture control. When you introduce a wet sponge, crystal, gel or beads, Boveda is absorbing the very high humidity given off by these 1-way humidification devices, giving you mixed results. Just use at least one Boveda per 25 cigar capacity for perfect and predictably precise results. When do I know when they need to be replaced? All Boveda will turn into a solid wafer when they’re dead. So it’s short of that, when there aren’t many soft spots left, that you’ll want to replace them. Pronounced crystallization and hardening of the corners first is completely normal. Our convenient website makes your re-ordering easy and completely worry-free. We write the date on the Boveda seal the first time we put them in our humidors/containers. It’s important to write on the seal so you avoid any chance of puncturing the Boveda by pressing the pen too hard. Writing the date on the Boveda makes it easy to know at a glance whether it’s time for replacements and reminds you how long they lasted. That way, you don’t have to take the time to physically handle all the Boveda and you don’t have to rely on memory to know the last time you replaced them. Keep The Cello or Remove The Cello? Cello also gives the delicate wrapper a small layer of physical protection. It shields the cigar wrapper from damage when you’re stocking your humidor or tossing one in your pocket for a dinner party. Thankfully, personal preference will persist. There’s no doubt cello serves an effective purpose, without a downside. Most premium tobacco has already been aged for some period, so the idea that you can age them quicker by removing the cello may or may not be true. ​ If you believe your cigar will taste better taken out of the cello, do it. ​Otherwise, we believe that if cello is good enough for most of the biggest cigar brands, they’re good enough for us. 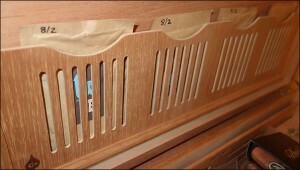 Humidors that have been out of commission for some time or suffer from neglect are little more than beautiful kindling. If the humidor has lost the moisture it badly needs, it needs re-seasoning. To make re-seasoning easy, we make an all-in-one Humidor Tune Up Kit. If you live in a dry climate it’s not unusual to need to re-season once a year, usually during the dry winter months. Like all Boveda products, our seasoning packs are easy to use and take the guesswork out of (re)seasoning your new or old humidor. Boveda seasoning packets provide a complete and even equilibration of moisture without causing mold or warping which can happen when following more antiquated seasoning methods. Nothing could be easier. Simply place the correct amount of Boveda seasoning packs inside your humidor (without cigars) and wait 14 days. Then replace the seasoning Boveda (84% RH) with the long-term lower (65%-75% RH) Boveda. Use one packet for every 25 cigars your humidor can hold. Don’t worry about what your hygrometer is reading while you season. The moisture of the air is not the moisture content of the wood.